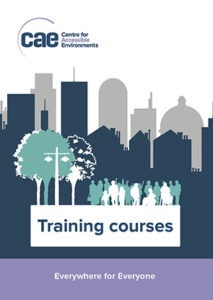 You can also download and read our training courses brochure for a full sample programme, or contact us to discuss our bespoke training options. We have been the leading training provider in the access field for over 30 years and were the first organisation to offer training for access auditors and consultants. Many industry leaders have received their training from CAE and have gone on to successful careers as access consultants. Facilities Manager, Dalkia acting for Metronet. Head of Health and Safety, Multiple Sclerosis Society. Development Manager, University of the Arts London.